I’m a bit of a rare bird. I was a fan of Eurythmics long before I ever heard them. I was previously a huge fan of The Tourists, the band from whence came Annie Lennox and Dave Stewart. When I had read that The Tourists had broken up in 1981, I was saddened as they were one of my favorite New Wave bands. Peet Coombs wrote great songs and shared lead vocals with Annie Lennox, who always sounded fantastic! To this day I still love The Tourists more then Eurythmics. More to the point, once I knew that Annie and Dave had started this new band, Eurythmics, I had to wait a long time before ever finding their releases. I had the indignity of reading about their releases for over a year before actually finding any for sale. It was late September in 1982 when I finally found the 7″ single of “Never Gonna Cry Again;” their debut single finally appearing for sale in a store near me a year ex post facto. I liked it and not much longer I managed to finally find a 12″ single in the used bins of Retro Records. The A-side was actually the second single from the “Sweet Dreams” album, but that record was completely non-existent in my world! I never saw that or their first album as imports. It wasn’t until the title track was released from it that the band finally had a commercial success when it [the fourth single] went to #2 in the UK. Then it crossed the Atlantic and became number one. At that point, the “Sweet Dreams” album was ubiquitous. However, that was a good eight months down the road from my snagging this 12 inch! “Your Time Will Come” in this live arrangement is absolutely stunning. After a Spanish recitation over a chirping rhythm box and rising backing vocals from Annie, Dave’s guitar rings solid with all of the power of the universe dawning. The opening chord of this song is without a doubt the best opening chord I’ve ever heard in my life. The Wasp synthesizer they used in performance added nervous, tense energy and a theremin-like quality to the song that was perfectly counterbalanced by Annie’s vocal, which was as calm and placid as the synths weren’t. The long arrangement of the song absolutely wipes the floor with the studio rendition of the song. Sadly, when Eurythmics were laboriously remastering their back catalogue in 2006, this track didn’t make the transition to CD. It remains for my definitive Eurythmics BSOG® to take it to digital format. “Never Gonna Cry Again” features a wonderful flute duet on the song between Annie and Tim Wheater that again, paints the studio version of the number very much in the shade. Next came a number that only appeared live on this disc. “4/4 In Leather” was a provocative number that had Eurythmics fans paying top dollar for this record for years later. I remember seeing multiple copies of this 12″ for sale months later in the legendary Record City import cutout bins and many are the times I’ve regretted not buying up all of them for resale. Annie had another flute solo [she was in orchestra in college] on this track that ratcheted up the tension. The final track was a methodical, relentless live version of “Take Me To Your Heart” from “In The Garden” that sported a long, spaced out intro as the song faded up gradually over a minute or so. The live side of this 12″ was a real treat since I had been searching for a long time to hear this music to no avail. It was still 1982 when I finally heard this, though. By the spring of 1983, Eurythmics would be household names worldwide. 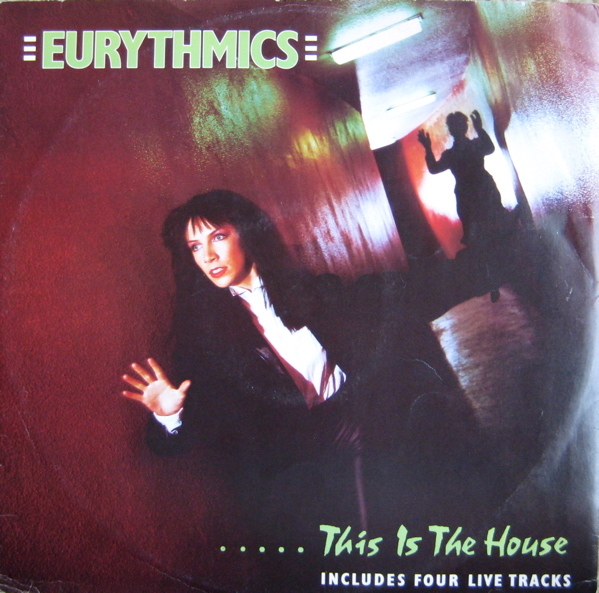 This entry was posted in Blast From The Past and tagged 12" singles, 1982, Annie Lennox, Dave Stewart, Eurythmics, This Is The House. Bookmark the permalink. I agree — the Tourists were better than the Eurythmics, but I’m very glad both happened! Thanks to the miracle of YouTube, I have heard this version of “Your Time Will Come” and what else is there to say other than … the Monk is right again! Damn you Monk, you’re costing me money:) Made me remember I’d been meaning to get the deluxe In the Garden for ages, always loved Never Gonna Cry Again. Seems it’s become scarce as seems to often happen these days with deluxe reissues, but picked up a cheap sealed copy on Ebay. Odd they left Your Time Will Come off. Simon H – Are you in the UK? Because on Amazon.com it’s easy to get a new, sealed copy of that DLX RM for as low as $2.41 + minimal postage! But, yes, I was severely disappointed that the best live track from the “This Is The House” 12″ was omitted. Yes I am, it’s weird several of the remasters are going for quite high prices here, Sweet Dreams is £40 for a new copy on Amazon. Thankfully I only paid £6.99 for In The Garden.